It’s always fun to see a craft distillery, relatively new on the scene, tackle something other than another vodka and go for that great old chestnut known as American Bourbon. Keep in mind that bourbon is a few hundred years old with generations of distilling history and tradition standing behind it. Arguably, to even get a decent bourbon you have to start at four, maybe five years of aging to get a mellow, flavorful and interesting result (it can be done in less time, but hard to get it right). In other words, if you want to make something with quality in a short period of time and compete in a crowded marketplace, you better roll up your sleeves because you have a challenge on your hands. To Dry Fly Distillery, this is just a normal day’s work. 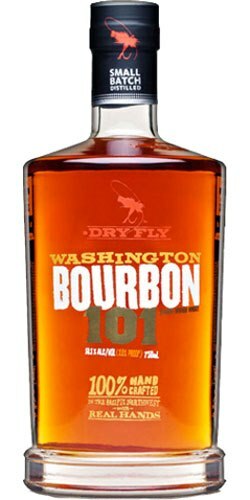 Dry Fly released a short time ago their first batch of Bourbon 101, their first new release since Washington Wheat in 2009. It is now part of the new Creel Collection along with Triticale, Port Finished Wheat, Cask Strength Wheat and Barrel Aged Gin. We have some bourbon aficionados in the club that know this spirit inside and out, but rather than being skeptical, we were rather excited to try it for reasons already stated. In terms of the mash bill we are looking at 60% corn, 20% wheat and 20% malted barley. Aged for only three years in standard 200L barrels (these guys do NOT micro-barrel), Dry Fly distilled a bourbon that defies its age. But do the flavors work? Nose- On the front end, buttery corn sweetness with some cornbread. Aromatic wheat notes. Some sweet caramel and honey as it opens up. Green apple and a little vanilla. Taste– Strong, creamy mouthfeel with some grain heavy flavors. A few accented sweet notes with a little fruit. Finish– Medium length. Strong explosion on the front end with hints of fruit. Charred oak (phew!) makes an appearance on the back end. 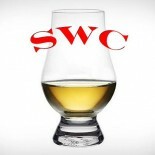 Comment– For a three year old bourbon it has big character. Great ABV and a nice nose. You can taste the skill that went into this bottle.